“Horses are my life!” I often hear this lighthearted statement from many equestrians … In my case it’s 100 percent true – both figuratively and literally! For the past 20 years, I’ve been a rider, competitor, trainer, instructor, and equine caretaker. 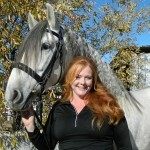 I was introduced to my first Andalusian at age 13, and these amazing horses have been my passion ever since. Currently I am employed by a large Southern California P.R.E. breeder as head trainer and instructor, and compete in regional breed and open competitions on Relampago ARM V (a 6-year old P.R.E. stallion). I began my equestrian career in the jumper arena. Following a serious injury in 1985 causing permanent damage to my right leg/ankle, I had to change my riding focus to dressage. 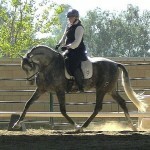 Dressage has provided me a wonderful opportunity to continue my equestrian pursuits. 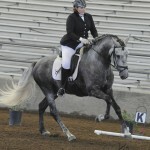 I’ve grown to love the sport of dressage for its focus on the horse and its harmony between horse and rider. Early in 2012 a great opportunity presented itself as I was assisting with a US Para-equestrian competition. The team doctor inquired about my disability and asked if I was interested in competing as a para-equestrian. I had never thought of myself as ‘disabled’ and was surprised to find out I qualified as a Grade IV para-equestrian. I began competing with the para-equestrians in mid-2012 and have set my sights on the 2014 World Equestrian Games and the 2016 Pan American Games. 2013 will be a pivotal year for me and my new goals as a para-equestrian. There will be many required para-equestrian competitions, in addition to my open competitions, thus I am in need of sponsorships and funding. To help in this regard, one of my supporters has initiated Iana’s Dream Team. This project brings together sponsors and other supporters to help reach this 2013/2014 competition goal and, in return, help my sponsors promote their products or services within the scope of a wonderful organization, the United States Para Equestrian Association (USPEA). All donations to Iana’s Dream Team fund are tax-deductible as allowed by law via the USPEA (www.uspea.org) organization.